Armstrong tires, one of the most popular brands of automobile and farm equipment tires in the 20th century, has its roots in West Haven, Connecticut. Over the better part of a century, the growth and decline of the company’s West Haven facilities mirrored larger cycles of economic expansion and contraction experienced on a national scale. George F. Armstrong founded the Armstrong Rubber Company in West Haven in 1912. 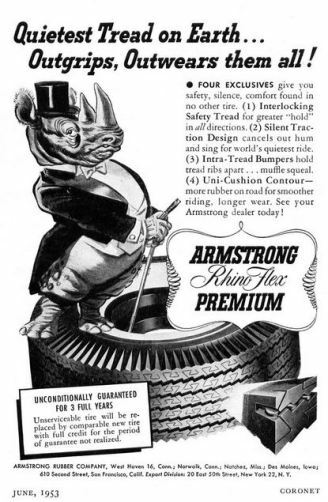 Unlike companies such as Goodyear, Firestone, and Uniroyal, Armstrong focused his attention on the replacement tire market, taking advantage of Americans’ propensity for holding on to their cars for long periods. Over the next 50 years, Armstrong Rubber benefited from America’s growing fascination with the automobile. In particular, the economic prosperity of the post-World War II era set Americans on the roads in record numbers. Driving on newly constructed highways and flush with spendable income, the demand for automobile tires skyrocketed. Between 1960 and 1969, annual US tire production grew from 119 million to over 200 million. In 1969, Armstrong’s net sales exceeded $201 million, representing an almost 15% increase from the previous year—the largest increase in company history. By the start of the 1970s, Armstrong’s fiberglass belted bias ply tire was among the most widely used tires in the country. In fact, Armstrong ranked as the nation’s 5th-largest tire seller and employed over 5,000 people. Because of this success, the company financed the construction of a new $7-million headquarters in New Haven. Unfortunately for Armstrong, the tremendous upheaval of the 1970s brought an end to much of the company’s prosperity. An economic recession, coupled with crippling gasoline shortages, kept Americans off the roads. Decreasing tire sales forced Armstrong to shutdown the West Haven plant for weeks at a time in order to avoid overproduction, and in 1979 the company laid off 120 of its West Haven workers. The following year, high fuel, labor, and electricity costs made operations in West Haven no longer viable. By 1980, the West Haven plant was the oldest and most expensive of seven Armstrong plants nationwide. The company opted to end manufacturing in West Haven, putting 600 local residents out of work. The West Haven facility operated briefly as a warehouse, but Armstrong’s parent company, the Armtek Corporation, eventually sold Armstrong to the Italian tire maker Pirelli S.p.A. for $190 million in 1988. Today, the Pirelli company continues to market the Armstrong brand of farm, commercial, and SUV performance tires on a global scale, a feat likely unimaginable to George Armstrong when he began his small West Haven operation over 100 years ago. Walsh, James A., and Newcomen Society in North America. 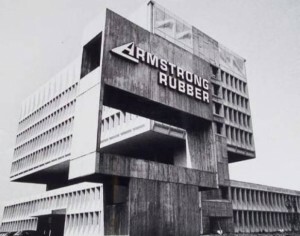 The Armstrong Rubber Company: Seventy Years of Progress in the Tire Industry. New York, NY: Newcomen Society in North America, 1982.